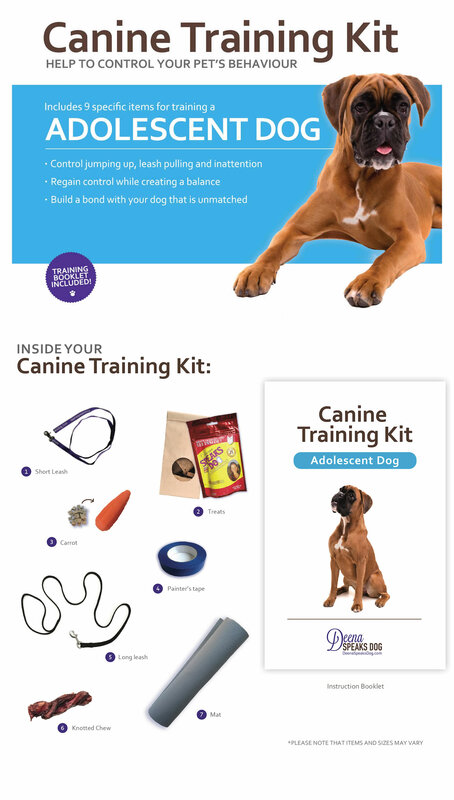 The Deena Speaks Dog Kit for Adolescent Dogs contains everything that you will need to get your dog back on track to be a well-behaved and friendly companion. Dealing with an unruly adolescent dog does not have to be an overwhelming experience. Using the kit will set both you and your dog up for success by interacting in a positive way. The kit is meant to be used between the ages of ? to ? years. You and your adolescent dog may have forgotten the lessons learned when the dog was a puppy. Your dog may have become disobedient, destructive or over exuberant. These exercises help to create a life balance of enjoyment and proper behaviour. They will channel the adolescent dog’s mental and physical energies in a constructive and enjoyable way. Each item in the kit has been carefully selected and is designed to be used with an exercise to make training easy for both you and your dog. Your adolescent dog will recall training basics and will be given corrections to unacceptable behavours.